9/6 WKND: Abert PTXC Record 15:21! Davison CR 17:33 @ RWB! Vids & features coming Sunday! 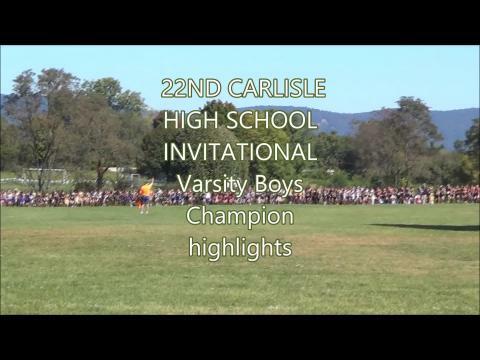 Kiski Area of District 7 hosted a 5 x 1 mile cross country relay race. The first race was a thriller as the varsity boys from Pine Richland, Norwin, and Franklin Regional finished within 32 seconds of each other. Pine Richland took an early lead, but Franklin Regional and Norwin closed the gap until the anchors received the batons in a virtual three-way tie. Norwin’s Dylan Colcombe ran the last mile in 5:07 to hold off Franklin Regional’s Brett Trottier. It was Norwin’s second win of the early season. In the girls race it was a contest of three Westmoreland County schools as Kiski Area, Franklin Regional, and Norwin claimed the top three spots. Franklin Regional’s Sterling Simek opened with a 5:58 to take an early lead. Kiski Area Letizia Collini closed the gap for the host team. Stephanie Lednak broke the race open for Kiski Area in the third leg opening a 39 second gap. Megan Aller held off Franklin Regional’s Bria McMahon for the win. Northeast Bradford boys put on a comfortable performance in the midweek invitational at Wyalusing Valley. The District 4 champions were led by a gold medal performance by Levi Upham (16:42.6) and four runners in the top ten to score 37 points to win by 36 over the host school. For the girls, Northeast Bradford completed the sweep, with Lydia Werner running 20:47.5 to win the gold medal and her team scoring 41 points to win by 37 points over Wellsboro. Northeast Bradford placed three in the top 7 overall to help their cause. 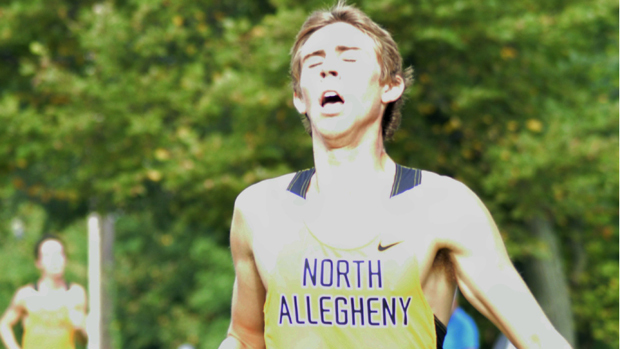 North Allegheny swept the individual honors at Saturday’s Red, White & Blue Classic in Pittsburgh. On the strength of the 1-2 finish by McGoey and teammate Hunter Wharrey (15:32.2), John Neff’s Tigers won Class AAA (and the overall title) with 59 points. Mt. Lebanon was next with 107,followed by North Hills (164), Central Catholic (166) and Morgantown, W.Va. (174). In Class AA, Grove City (PA#2) was the champion with 48, while Quaker Valley was second with 74 and South Fayette third with 112. Sewickley Academy won Class A with 58, while Our Lady of Sacred Heart had 66 and Avonworth(PA#5) was third with 107. "Today, I was excited to go out and run my first big race since track season,” Davison said. “Going into the race, I knew the competition would be stiff with Marianne Abdalah and Kelsey Potts, who are very talented runners and tough racers.Sure enough, the three of us stuck together through the first (mostly downhill) mile, which we completed in about 5:20. “Close to the 1.5-mile mark, the course begins a gradual incline that lasts until the last half mile, and since I was feeling relatively good, I started to pick up the effort at that point. Considering the heat and humidity, I was very happy with my race. This is definitely the fastest course we run on all year, and it was a great feeling to improve my time from last year. I'm looking forward to PIAA Foundation so I can test my training on the Hershey course in a couple of weeks." Results of the girls’ varsity race have been delayed because of technical difficulties with the timing service. At 2 p.m. Sunday, meet officials said that the timing service was using finish line video to confirm final and official results and that they would be released as soon as available. The North East 1-2 punch of Rachel White and Kate McIntosh were at it again at the West Middlesex Invite. The freshman and sophomore pair finished 1-2 in the girls red race, with White winning the race in 19:51 and McIntosh hitting the 20:00 even mark for 2nd. That 1-2 performance was just enough to get their North East teammates over the hump to the team title over Laurel 75-76, the closest finish so far in the early season. Knoch was 3rd with 81 points. In the white race, Reilly Walsh of Cambridge Springs held off Chloe Tyillian of host West Middlesex to win the individual crown by 6 seconds with a time of 20:28. Behind Tyillian's runner up finish, West Middlesex were excellent, placing six of the top 12 finishers to score 34 points and cruise to the team title. For the boys, the red race was also a close chase to the team title, as Corry Area knocked off Knoch by 3 points, 75-78, to win the team title, using a 52 second 1-5 spread to make up for Knoch's 4-5-9 start. Individual honors went to Andrew Maxwell of Slippery Rock Area, as his 16:43 was good enough for him to earn a 30 second victory. The white race saw the 2nd one point team finish of the day, as Cranberry defeated the host West Middlesex 86-87, thanks to having five in the top 25 against West Middlesex's five in the top 35. Hanz Wents of Maplewood ran 17:38 to earn a 7 second victory over Nathan Kline of Cochranton. CB East girls won the first of many head to head battles with league rivals North Penn at their home invitational. Lizzie Morris and Jackie Kinkead led the way for the Patriots, by finishing 1-2 for their team. Morris ran 19:36, while Kinkead ran 19:51. CB East placed six of the top ten runners to North Penn's three in the top ten to win the team title 20-37. For the boys, Jake Brophy and his CB East squad completed the team and individual title sweep against, defeating neighboring rivals Central Bucks West. 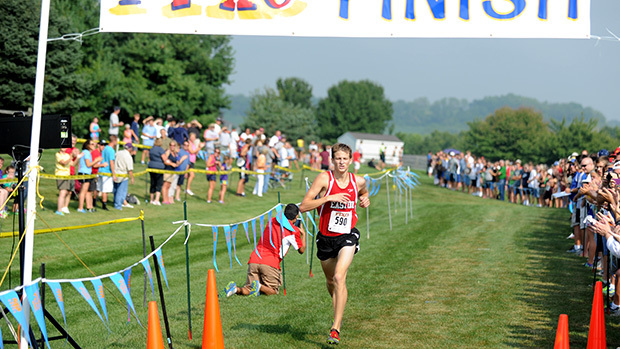 Brophy won the individual crown with a season best 15:59 to make it two wins in his first two races. His teammates stepped up to the plate against the John Sharp winners behind him, placing four more in the top nine to take the win 28-51. Jerrica Bauer of George School made her season debut and she was excellent in victory. 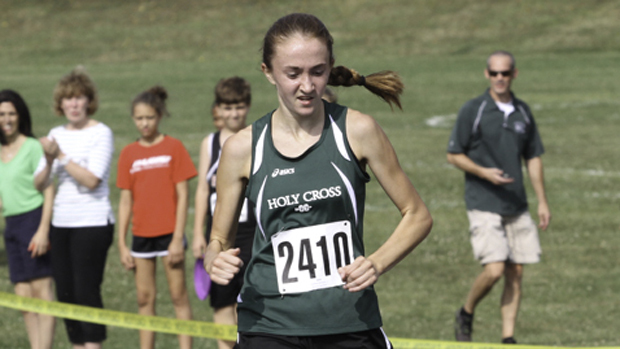 The junior won the race by nearly a full minute with a time of 18:36, defeating the sister pairing of Caroline and Lizzie Harmon of Lower Moreland. In the team race, Council Rock North placed four in the top ten to get the best of their rivals Council Rock South for the team title 45-66. For the boys, Brian Arita of North Penn made it to the winners circle with a time of 16:15, holding off Bensalem's Alex Ramirez by 8 seconds. Ramirez did win gold with his teammates, as his team placed five in the top eleven to win the team title over Council Rock North by a narrow 3 points, 34-37. 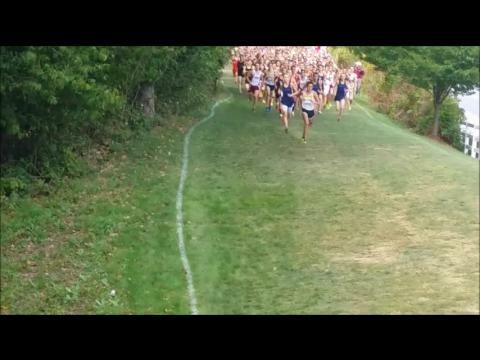 Malvern Prep made their 5K invitational debut on Saturday and made a great first impression to kick off their season! Jackson Hoey led the way for the Friars with a meet winning performance of 15:52. Teammate Billy McDevitt finished 2nd with a time of 16:09. Malvern placed four of the top seven runners to cruise to the team title Downingtown West 30-53. Henry Sappey did finish 3rd in 16:20 for the Whippets to lead their runner up effort. For the girls, Strath Haven got their season off to a flying start, placing three of the first six and four of the top nine to win by a large margin over the field. Maia Mesyinger led the way for Strath Haven with a winning performance of 19:55 to hold off Lotte Black of Wissahickon by a slim 4 second margin. Teammate Claire Wolters finished 3rd in 20:15. Masterman boys started their march back to the Class A state championship final with a victory over Springside Chestnut Hill 22-52. Julian DeGroot-Lutzner led the way for Masterman with a victory in 17:01, 45 seconds better than the field. In the girls race, Terri Turner and Jamie Costarino helped turn the tables for the host team against Masterman, as Springside Chestnut Hill defeated the District 12 Class A champs 23-34. Turner won the race in 20:25, while Costarino finished close behind in 2nd in 20:34. St Joe's Prep boys had a strong performance from their top two runners, as champion Isaiah Fisher (16:40) and runner up Joseph Piscano (16:52) took the first two places. Behind them, however, Palmyra placed four together in front of the Prep's #3 runner, which was just enough to take the team title from the District 12 squad by a score of 62-69. Jason Robinson led the team winners with an 8th place finish. For the girls, the chase for the individual gold was extremely tight. Not only did the top six finish within 8 seconds of each other, but the winner of the race was decided by one hundredth of a second, and the win went to Elaine Estes of Oxford Area over Jamie Zamrin of Cocalico. Both runners ran 19:42. In the team race, Palmyra started life in the AAA division on a high note, placing three of the top six and five of the top eleven to score 32 points and win by 40. The Northampton Invitational was the first race of the 2014 season for the Class A state champions Holy Cross. For those who came to see how the champs would start their title defense, they were far from disappointed. Mackenzie Greenfield led the way for Holy Cross with an individual title win in 18:51, just 3 seconds ahead of freshman teammate Lexi Walsh. The team accounted for six of the top ten finishers to cruise to the team title with 25 points to defeat the hosts Northampton by 30. For the boys, Schuylkill Valley were boosted by a gold medal performance from Clay Stabolepzy (16:39) to come away with the team title over East Stroudsburg South 81-101. Freshman Ben Reisenweaver finished 3rd for Schuylkill Valley to help lead his team to the crown. 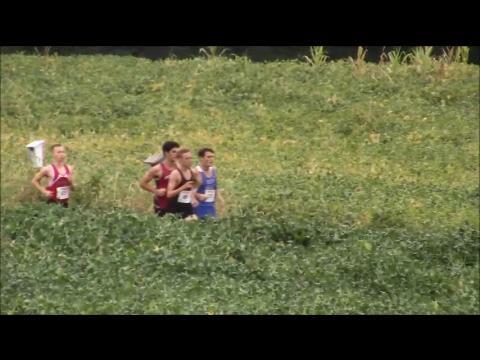 The conditions were hot, and so was the running at PTXC 6 at Kutztown University. Colin Abert of Easton was the convincing winner in the opening varsity race of the day - boys’ Gold. The senior crushed the meet record on the Farm Course at 15:21.37, while Dominic Hockenbury of Lake-Lehman was second in 15:58.19. Third went to Zach Seiger of Red Land in 16:19.00. Maryland state champion Severna Park wound up on top of the 22-team event, with a pair of top 10 runners leading the way to a winning 81 points. Easton Area was next with 116 points, and Cumberland Valley was third with 128. In the girls’ Gold race, Marissa Sheva of Pennridge and Mady Clahane of Cumberland Valley were the class of the field. A senior, Sheva was out front after the opening mile and stayed there, hitting the chute in 18:48.61. Clahane was nextin 18:57.70 as only the top two broke 19:50. Senior Lindsey Oremus of Dallas eked out third in 19:54.08. On the team side, Cumberland Valley got off to a great start with Clahane’s No. 2 finish and claimed the Gold championship with 88 points. The winner’s 2-4 runners of freshman Jess Strome, sophomore Marie Rulapaugh and frosh Grace Bechtel were separated by just 5 seconds. Perkiomen Valley (130) and Parkland (139) were next in the team standings. 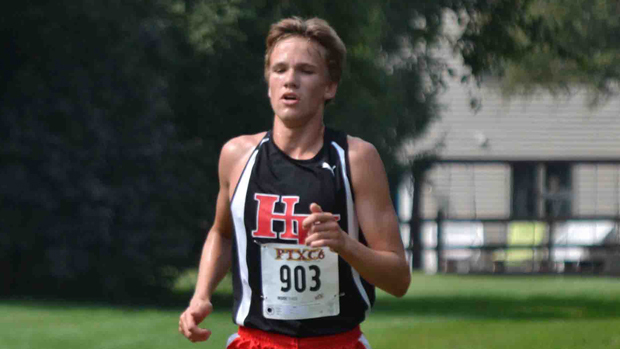 Casey Comber of Hatboro Horsham defended his boys’ Blue individual title, touring The Farm Course in 16:29.35. 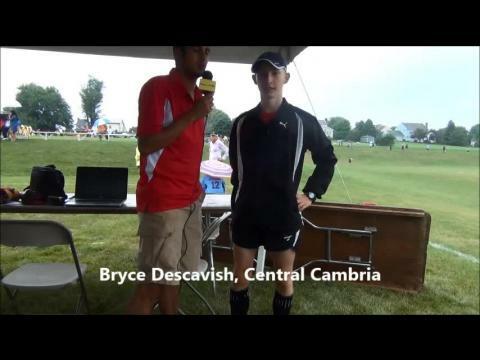 Central Cambria’s Bryce Descavish was the only other finisher under 17 minutes, crossing the line in 16:58.70, while Blake Ettien of Coatesville was third in 17:16.63. Comber and his Hatter teammates claimed the Blue team crown with 92 points, placing a trio in the top 10 to slip past Coatesville’s 97. Dallas was third with 120. Top honors in the final varsity race of the day went to Brooke Hutton of Coatesville. The freshman stopped the clock in 19:46.82 and had the closest margin of victory as senior Kierra Zack of Northern was No. 2 in the girls Blue race in 19:49.96. The Blue team standings were not as tight as Central Cambria – and its all-underclassmen top 5 – scored a comfortable victory. The Red Devils finished with 40 points as their top 4 – sophomores Samantha Koss, Sydney Gilkey, Emma Wess and Sydney Croft – were third through sixth and only separated by 21 seconds. Ephrata was the runner-up with 90, while Elk Lake placed third with 162. RACE FEATURE: HUTTON HOLDS OFF ZACK IN CLOSE FINISH FOR 1ST WIN! 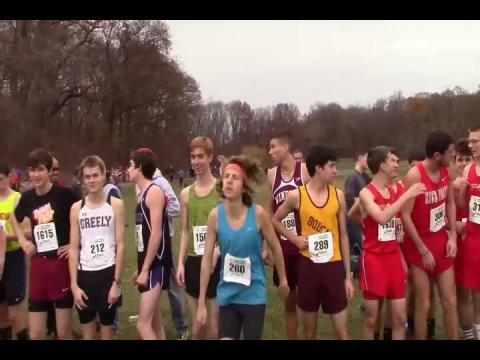 Pennsbury swept the annual 4x8 Mile relay to get their 2014 seasons off to flying starts! The girls were dominant at Belmont Plateau, with the four legs of Olivia Sargent, Hannah Molloy, Erin O'Connell, and Meridith Twomey running 52:12 for the 8 mile relay to win by over two minutes. Two of the four legs dipped under the 13 minute mark. Hempfield (3) finished 2nd, 30 seconds ahead of Padua of Delaware. Pennsbury's boys also won by a large margin, with the team of Sam Webb, Thomas Wick, Alek Sauer, and Ari Bortman combining to run 44:18 for 8 miles to win by almost 100 seconds. One of their legs ran a blazing 10:40, while the other three were just over 11 minutes. Spring Ford finished 2nd in 45:59 with a 10:22 leg. AAA girls champions Unionville were back on their relay grind, making a visit to West Chester Henderson for the 4x2400 meter cross country relay. The three girls teams of four took the first three team spots for Unionville, with the three teams separated by just 13 seconds. The team of Kacie Breeding, Gretchen Mills, Lea Talley, and Virginia Korrell ran 39:26 to win the relay. For the boys, host West Chester Rustin took the top two boys team spots with only 14 seconds separating the two teams. The team of Jack Carmody, Eddie Hapstead, Jimmy Cook, and Matt Coates ran 33:07 to earn the win. The Cardinal O'Hara girls made their season debut and put their young talent on display, as only one of the top seven, and four of the 18 runners that participated were seniors. O'Hara placed five in the top eleven with a solid 44 second spread to score 31 points and win by 19 over Owen J Roberts. Individual honors went to Lexi VanBlunk of Downingtown East, who ran 20:27 to win the race by 10 seconds over Sara Hayes of Cardinal O'Hara. For the boys, Twin Valley used the senior foursome of champion Josh Coakley (17:07), runner up Colin Geary, bronze medalist Colby Geary, and 4th place finisher Dominic Digiacomo to lead their team to a 23-61 win over Downingtown East. The four were separated by only by just 13 seconds. Athens Area traveled to New York to compete at the Windsor Invite. Maria Hudock led the way for the girls with a 3rd place finish in 21:58. Her team would also finish 3rd with 75 points. Kevin Singhel finished 36th in 20:13 to lead the boys team to an 8th place finish.